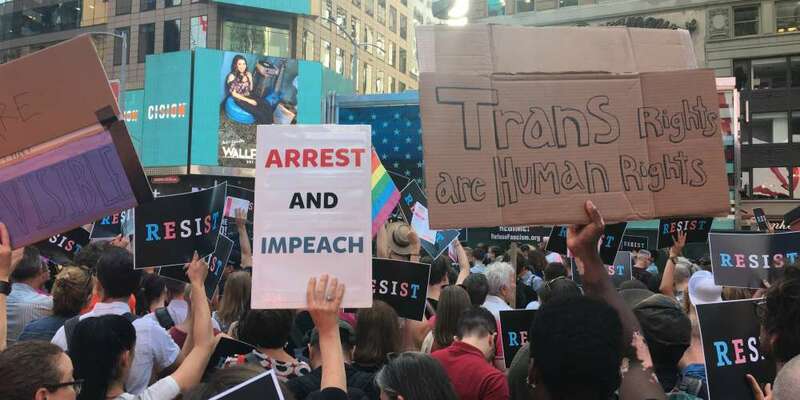 Hundreds of New Yorkers gathered in Times Square Wednesday night to protest President Donald Trump’s ban on transgender service members in the military. Police sources said that there were more than 500 people at the spontaneous gathering. Mark-Viverito said she was “appalled and angry” at the president’s decision. Signs that read “Resist” in blue, pink and white lettering spotted the crowd. 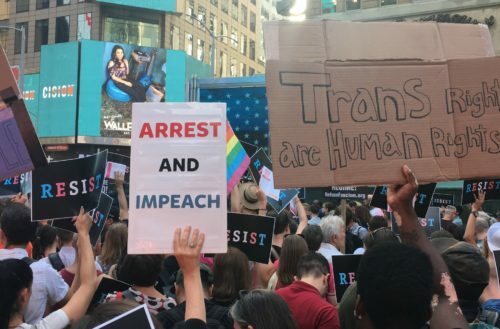 Other signs reading “Trans people are not a burden” and “Our diversity is our strength” speckled the crowd, too. Erika Barker stood in the back, listening, holding a sign showcasing statistics that transgender service members in the military actually cost the government very little. “I am here because I am a trans military veteran and served in Iraq, Afghanistan and Guantanamo,” she told us. A military combat photographer, Barker served her country from from 2004 to 2009. Barker explains she served before she officially transitioned. “You couldn’t transition [in the military] back then,” she says. “I was taking hormones illegally, purchasing them off the internet. I was slowly starting to change. I had to get out quick, because you go get your physical and they wonder why you’re growing breasts and why you’re so skinny. Then they take a blood test and you get kicked out. You don’t get your honorable discharge.